As we reported earlier this year, mobile payments company Square revealed that it was planning to add a number of new operational capabilities and data analysis to the register, including in-depth analytics. Tonight, Square is debuting this functionality in the form of a new iPad app. 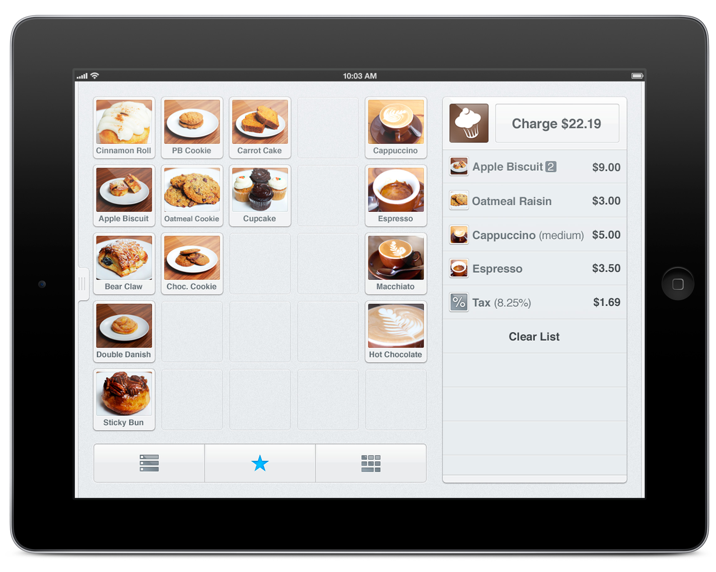 The app aims to replicate the actual experience of a register, similar to Square’s existing iPad app. But this new, free app, called Square Register, comes as a more full-fledged point of sale offering. You can access the app here. The app has a completely new UI, and a better integration with Card Case, which is Square’s consumer-facing loyalty, payments and merchant-discovery app. For example, merchants can publish their business’ profile to the Card Case directory so customers can find them as they explore a given city. The app also includes customer notifications, so merchants know when regulars and new customers arrive at their store using Card Case. Basically, the new app’s UI has been reconfigured so that it’s a perfect fit for brick and mortar businesses, whether they have 10 items or 10,000. Custom item arrangement allows merchants to create a mobile version of their store. The app also allows for custom permissions for employees on the register, giving merchants control and access to specific features, settings, or sensitive information in their sales reports. And with a single tap on the iPad, merchants can wirelessly print receipts or open a cash drawer to make change. The new app and Square also features in-depth analytics, allowing merchants to segment consumer payments data and transactions. The dashboard provides a glance of basic sales information and recent transaction history, including the number of payments, subtotals, tax, tips, refunds, account deposits, etc. It also shows several interactive data sets, breaking down sales by month, days of the week, time of day, and even size of payment. 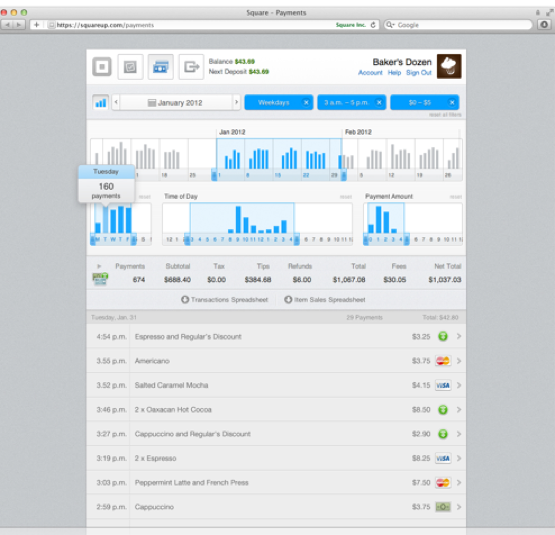 Merchants can access and explore these analytics when they log into their Square account online as well. Additionally, Square says it is now processing $4 billion in payments volume per year, which is up from $2 billion in mobile payments volume expected in October 2011. For Square, this new app is about giving merchants tools for free that big-box retailers have been enjoying for years. The company’s existing iPad app was released last year, and the app has seen increased adoption amongst brick and mortar businesses. So this app aims to provide merchants with even more features to help make running a business easier. 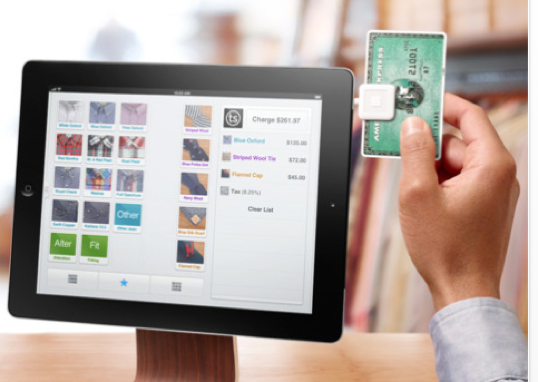 And Square is betting on the iPad as the go-to device for smaller merchants to manage their businesses. 2011 proved to be an eventful one for Square. The company ended the year with over 1 million merchants using the mobile payments platform to accept credit cards (there are only 8 million merchants who accept credit cards in the US). In November, Square announced it was processing $11 million in payments per day (up from $4 million a day in July). Sir Richard Branson, Kleiner Perkins, Visa, and other investors poured over $100 million over the course of the year into Square, with the company’s latest valuation pegged at $1 billion. Not to mention the unveiling of retail deals with Apple, Wal-mart, Best Buy, Radio Shack, and Target. Already this year, Square has debuted two new retail deals—OfficeMax and select UPS Store locations. And now that Square has tackled analytics and the register for merchants, we’re expecting a more personalized experience for Card Case and perhaps international expansion as well in 2012.